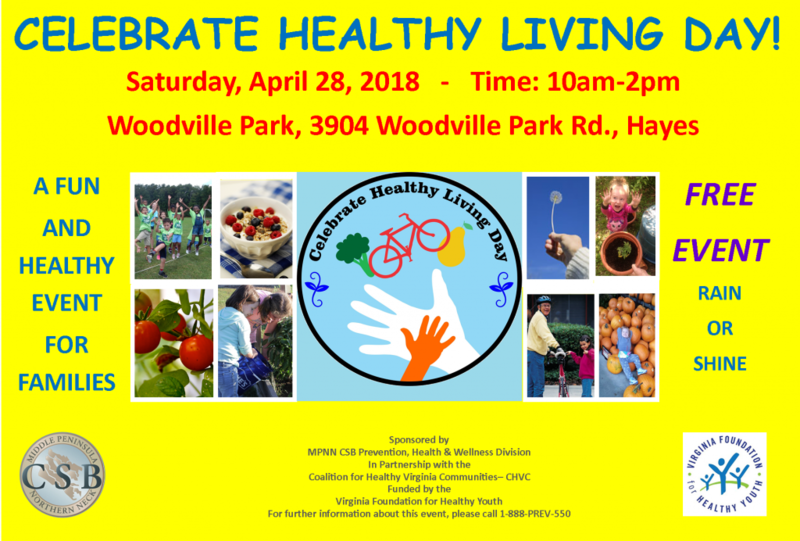 The 6th Annual Celebrate Healthy Living Day Event will be held on Saturday, April 28th, from 10:00 am – 2:00 pm at Woodville Park (3904 Woodville Park Rd., Hayes, VA)! This event is sponsored by the Middle Peninsula-Northern Neck Healthy Community Action Team (HCAT), in partnership with the Middle Peninsula-Northern Neck Community Services Board’s Prevention, Health and Wellness Division. It is made possible through grant funding from the Virginia Foundation for Healthy Youth. The Celebrate Healthy Living Day is a FREE community event jam-packed with fun and healthy activities for families to enjoy together! We are inviting all local vendors/business/exhibitors as partners to participate in this special occasion and to highlight health and wellness by offering samples, freebies, and/or services of healthy products and activities. There is NO COST to being a vendor! This is a rain or shine event! We hope to see you on April 28th!